Real Riders: Husqvarna Aims to Become Europe’s Third-Largest Bike Brand by 2020 ! Husqvarna Aims to Become Europe’s Third-Largest Bike Brand by 2020 ! 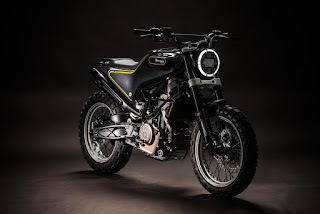 Husqvarna's owner at KTM have confirmed that the firm’s Svartpilen and Vitpilen concept bikes will reach production in several different forms with the first variants arriving in showrooms as early as next year. 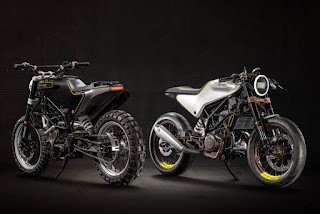 The first two machines will both be Vitpilen models – naked, café-racer styled machines – but the scrambler-influenced Svartpilen is also confirmed for production as part of a plan to build Husqvarna into Europe’s third-largest motorcycle maker behind KTM and BMW by 2020. So far Husqvarna has shown two Vitpilen concept bikes – the 401 and 701 – as well as the Svartpilen 401. The ‘401’ machines are basically restyled KTM Duke 390s, sharing the frame and engine of the Indian-built, Austrian-badged machines. The larger Vitpilen 701 similarly uses KTM’s Duke 690 as its basis. Although not officially shown yet, smaller 125cc Vitpilen prototypes derived from the Duke 125 have also been spotted on test recently. It’s likely that the 125cc machine will be fast-tracked to production as one of the 2017 models alongside the Vitpilen 401, with the larger Vitpilen 701 reaching showrooms slightly later. This may be the last time that KTM’s plans are hinted at by its annual report, as the firm has made a move to buy back its publicly floated shares and delist from the Vienna stock exchange. At the moment, just 0.6 per cent of KTM is publicly held, with the remaining 99.4 per cent shared between Stefen Pierer’s CROSS KraftFahrZeug Holding GmbH (51.4 per cent) and the firm’s Indian manufacturing partners Bajaj (48 per cent). The firm has announced plans to offer existing shareholders €122.50 ($183.55) per share, the average price for the last six months. Once de-listed, the firm will no longer be obliged to publish detailed annual reports, which in the past have betrayed KTM’s future plans. Previouls reports revealed the existence of several new models, including the single-cylinder RC390, long before they were officially announced.